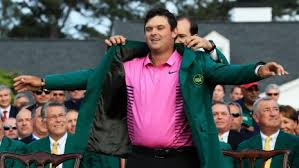 Master's champion Patrick Reed receiving his green jacket. The weekend before last, The Favorite Son (TFS) and I watched on television the final round of the Master's Tournament. TFS's favorite golfer is Tiger Woods, but we didn't get to see much of him during the last round. As final rounds go, the final 18 holes at August National this year was fairly entertaining. Patrick Reed finished at -15, holding off Rickie Fowler (-14) and Jordan Spieth (-13), who tied a Master's Tournament record with a final round of nine under par. With Fowler in the clubhouse at -14, Reed continued to make great shots and clutch putts as he came in. TFS asked, "What happens if two players tie?" I answered, "The golfers who finish 72 holes, tied, play sudden-death holes until one player scores better than the other or others." TFS thought for a moment and, finally, said, "Well, there's only one green jacket."